Nicholas Roerich was born in St. Petersburg, Russia, on October 9, 1874, the first-born son of lawyer and notary, Konstantin Roerich and his wife Maria. He was raised in the comfortable environment of an upper middle-class Russian family with its advantages of contact with the writers, artists, and scientists who often came to visit the Roerichs. At an early age he showed a curiosity and talent for a variety of activities. When he was nine, a noted archeologist came to conduct explorations in the region and took young Roerich on his excavations of the local tumuli. The adventure of unveiling the mysteries of forgotten eras with his own hands sparked an interest in archeology that would last his lifetime. Through other contacts he developed interests in collecting prehistoric artifacts, coins, and minerals, and built his own arboretum for the study of plants and trees. While still quite young, Roerich showed a particular aptitude for drawing, and by the time he reached the age of sixteen he began to think about entering the Academy of Art and pursuing a career as an artist. His father did not consider painting to be a fit vocation for a responsible member of society, however, and insisted that his son follow his own steps in the study of law. A compromise was reached, and in the fall of 1893 Nicholas enrolled simultaneously in the Academy of Art and at St. Petersburg University. The late 1890’s saw a blossoming in Russian arts, particularly in St. Petersburg, where the avant-garde was forming groups and alliances, led by the young Sergei Diaghilev, who was a year or two ahead of Roerich at law school and was among the first to appreciate his talents as a painter and student of the Russian past. One of Diaghilev’s first achievements was the founding, with Princess Maria Tenisheva and others, of the magazine The World of Art. This magazine enjoyed a relatively short life but had an important influence in Russian art circles. The magazine declared itself the enemy of the academicians, the sentimentalists, and the realists. It introduced to its readership, which was made up mostly of the intelligentsia, the vital elements of Russian artistic circles, European post-impressionism, and the modernist movement. Roerich contributed to it and sat on its editorial board. Other Russian painters involved were Alexandre Benois and Leon Bakst, who later became Roerich’s co-workers in the early days of Diaghilev’s Ballets Russes. After finishing his university thesis, Roerich planned to set off for a year in Europe to visit the museums, exhibitions, studios, and salons of Paris and Berlin. Just before leaving he met Helena, daughter of the architect Shaposhnikov and niece of the composer Mussorgsky. There seems to have been an immediate mutual attraction, and they were soon engaged to be married. On his return from Europe their marriage took place. Helena Roerich was an unusually gifted woman, a talented pianist, and author of many books, including The Foundations of Buddhism and a Russian translation of Helena Blavatsky’s Secret Doctrine. Her collected Letters, in two volumes, are an example of the wisdom, spiritual insight, and simple advice she shared with a multitude of correspondents—friends, foes, and co-workers alike. Later, in New York, Nicholas and Helena Roerich founded the Agni Yoga Society, which espoused a living ethic encompassing and synthesizing the philosophies and religious teachings of all ages. Prompted by the need to provide some income for his new household, Roerich applied for and won the position of Secretary of the School of the Society for the Encouragement of Art, later becoming its head, the first of many positions that Roerich would occupy as a teacher and spokesman for the arts. Roerich determined to overhaul the Society and rescue it from the academic mediocrity it had foundered in for many years. He instituted a system of training in art that seems revolutionary even by today’s standards: to teach all the arts—painting, music, singing, dance, theater, and the so-called “industrial arts”, such as ceramics, painting on porcelain, pottery, and mechanical drawing—under one roof, and to give his faculty free rein to design their own curriculum. The cross-fertilization of the arts that Roerich promoted was evidence of his inclination to harmonize, bring together, and find correspondences between apparent conflicts or opposites in all areas of life. This was a hallmark of his thinking, and one sees it demonstrated in all the disciplines he explored. He constantly sought to break down compartmentalization, and, indeed, even in his own art he defied categorization and created a universe uniquely personal. In his writings on ethics also, it can be seen that he constantly sought to connect ethical problems with scientific knowledge of the surrounding world. It was Roerich’s gift that these “connections” appeared so natural to him and presented themselves in all life’s manifestations. And it was this talent for synthesis, which he admired in others and encouraged in the young, that enabled him to correlate the subjective with the objective, the philosophical with the scientific, Eastern wisdom with Western knowledge, and to build bridges of understanding between such apparent contradictions. He reminded us that these contradictions were often the result of man’s ignorance, and that an expanding consciousness, which each individual was duty-bound to pursue, would lead to eventual recognition of the illusoriness, or relativity, of things. As Garabed Paelian affirms in his book Nicholas Roerich: Roerich “…learned things ignored by other men; perceived relations between seemingly isolated phenomena, and unconsciously felt the presence of an unknown treasure.” Perhaps it is this “unknown treasure” that in Roerich’s paintings speaks to the viewer who is attuned to that underlying meaning, and further explains the transcendental feelings that some experience through his canvases. In 1902, the Roerichs celebrated the birth of their first son, George, and in the summers of 1903 and 1904, they set off on an extended tour of forty cities throughout Russia. Roerich’s purpose was to contrast the styles and historical context of Russian architecture. The voyage was one of discovery, for wherever they went he was able to locate the remnants of Russia’s past—ancient monuments, churches, city walls, and castles. He found that these had, in many instances, been neglected for centuries. As an archeologist and art historian he was aware of what an important key they were to Russia’s cultural history. He determined to draw attention to the situation and somehow arrange to have them protected and preserved, and with this goal in mind painted a series of seventy-five works depicting the structures. The experience of this journey had a lasting effect, for on his return in 1904, Roerich promulgated the plan that he hoped would create protection everywhere for such cultural treasures, a plan consummated thirty-one years later in the Roerich Pact. This kind of thinking was not common in those days, and anticipated the importance that, today, most countries of the world place upon preservation of their cultural heritage. In 1904 Roerich painted the first of his paintings on religious themes. These mostly dealt with Russian saints and legends, and included Message to Tiron, Fiery Furnace, and The Last Angel, subjects that he returned to with numerous variants in later years. The Treasure of the Angels was described by one writer: “A host of angels in white garments stand silently row after row guarding a mysterious treasure with which are bound up the destinies of the world. It is a blue black stone with an image of the crucifix cut into it, glowing with emerald hues.” The angels are an early depiction of the hierarchical Masters that peopled the heart of Roerich’s belief in a Great Brotherhood, watching over and guiding humanity in its eternal journey of evolution. The “stone” pictured by Roerich is the representation of an image that recurs in different forms in his paintings and throughout his writings. The word “treasure” figures prominently in the titles of many of Roerich’s paintings, as, for instance, in The Treasure of the Mountain and Hidden Treasure. It is clearly not material wealth that he refers to, but rather the spiritual treasures that lie buried, yet available to those with the will to unearth them. Meanwhile Roerich’s search for archeological treasures continued. The Stone Age particularly intrigued him, and he amassed a large collection of artifacts from that era. His paintings frequently reflected this interest, as in Three Glaives in which the subject matter is archeological in nature, and relates to an ancient legend. Roerich wrote about the unusual similarity of Stone Age techniques and methods of ornamentation in far-separated regions of the globe. In comparing these correspondences, he came to instructive conclusions as to the commonality of human expression and creativity. In 1906, in the first of many entrepreneurial efforts that were to bring Russian art and music to the attention of Europeans, Sergei Diaghilev arranged an exhibition of Russian paintings in Paris. These included sixteen works by Nicholas Roerich. The next year, Diaghilev introduced Fyodor Chaliapin to Paris audiences, along with the music of Mussorgsky, Rimsky-Korsakov, Borodin, Rachmaninov, Scriabin, Glazunov, Stravinsky, and others. In 1909 he presented Chaliapin in Rimsky-Korsakov’s Ivan the Terrible, with costumes and sets designed by Roerich. In the Polovtsian Dances from Borodin’s Prince Igor, also designed by Roerich, and in other ballets, Diaghilev introduced a corps of Russian dancers that later became famous as the Ballets Russes, which included Pavlova, Fokine, and Nijinsky. Roerich’s designs furthered his reputation for the telling depiction of ancient cultures and their practices. Diaghilev pioneered an art form that involved the collaboration of the designer as “auteur.” Thus Alexandre Benois influenced the creation of the ballet Petrouchka, and Nicholas Roerich was the prime mover and, with Igor Stravinsky, the co-creator of the ballet Le Sacre du Printemps, or, The Rite of Spring. At first entitled The Great Sacrifice: a Tableau of Pagan Russia, the motif for the ballet grew out of Roerich’s absorption with antiquity and, as he wrote in a letter to Diaghilev, “the beautiful cosmogony of earth and sky.” In the ballet Roerich sought to express the primitive rites of ancient man as he welcomed spring, the life-giver, and made sacrifice to Yarilo, the Sun God. It was a story unlike that of any ballet before it. Stravinsky’s score and Nijinsky’s choreography were equally unexpected, and provoked controversy that was to continue for many years. In Battle in the Heavens Roerich used the violent contrast of light and darkness to suggest the terrible events that would soon overtake Russia and all Europe. In 1915 Roerich became ill with pneumonia, and was sent by his doctor to recuperate with his family in Sortavala, Finland. This was a period of great unrest the world over, and no less so in the lives of the Roerich family. In Roerich’s paintings of the period, such as Karelia—Eternal Expectation and The Waiting Woman the cold, austere countryside of rocks and uninhabited shores of the north seems to express a sense of poignant longing. In The Waiting Woman, her gaze is fixed on the horizon as if she awaits some sign of the return of long-gone voyagers. By 1917 the revolution was raging in Russia and returning there would have been dangerous. The family began making plans to visit India, whose magnetic appeal had been felt increasingly during these years. This became a possibility in 1918 when Roerich was invited by a Swedish entrepreneur to exhibit his paintings in Stockholm. From there the family proceeded to London, where Sir Thomas Beecham had invited Roerich to design a new production of Prince Igor for the Covent Garden Opera. Meanwhile, an invitation to come to America was extended by the Chicago Art Institute. It was accepted, and the tour opened successfully at the Kingore Gallery in New York in 1920. In addition to exhibiting over 400 paintings there and in many cities throughout the United States, Roerich designed the scenery and costumes for productions of The Snow Maiden, and Tristan and Isolde for the Chicago Opera Company. During his travels in America, Roerich painted a series in New Mexico, and the Ocean Series in Monhegan, Maine, where the family spent a summer. He responded to the spirit of enterprise he found in America and frequently wrote about the positive influence its developing technology would have on the world. Seeds were planted and the lives of individuals influenced by Roerich’s magnetism and sense of mission. In 1921, in New York, he founded the Master Institute of United Arts, in which he planned to realize the educational concepts he had incorporated into the curriculum in St. Petersburg. He attracted a talented group of instructors. They included Deems Taylor, teaching musical theory and composition, Robert Edmund Jones and Lee Simonson, teaching theater design, and top quality instructors in courses that included all musical instruments, aspects of painting and drawing, design and illustration, sculpture, architecture, ballet, drama, journalism, and languages—and lectures were presented by noted individuals such as George Bellows, Claude Bragdon, Norman Bel Geddes, and Stark Young. The Master Institute flourished, but it did not survive beyond 1937. While the country was in the grips of the Great Depression and the Roerich family was on expedition in the Far East, funds ran out and events caused a complete collapse of the organization that Roerich and his supporters had labored to build. 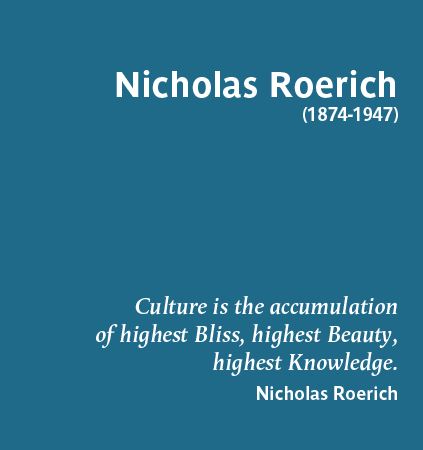 It was not until 1949 that, under the direction of Sina Fosdick, one of the founding board members and an Institute faculty member, the institution was reborn as Nicholas Roerich Museum, in a brownstone on West 107th Street, where it has remained until the present. Many paintings from the original collection can now be seen there, and in the intervening years major works have been added, making it one of the most comprehensive collections of the artist’s work in the world. During their stay in America the Roerichs continued to plan for the voyage to India. An orientation toward Eastern spiritual values is reflected in much of Roerich’s creative work of the time. This is seen in his Ocean Series—the three paintings, Himself Came, The Bridge of Glory, and Miracle demonstrate the spiritual power that was beginning to characterize his work. In The Bridge of Glory, Saint Sergius of Radonezh walks in contemplation before a blue bridge formed by the aurora borealis, Roerich’s metaphor for the future spiritual bridge that will connect heaven and earth. Between 1916 and 1919 Roerich had written a collection of sixty-four blank verse poems that were published in Berlin, in Russian, under the title Flowers of Morya, and subsequently published in English as Flame in Chalice. 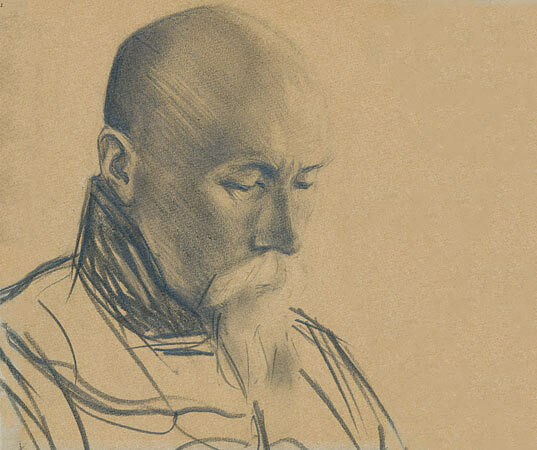 In them we find Roerich’s inner journey charted and his commitment to spiritual search stated. These poems evoke some of the images that Roerich later used in his paintings, and in a way help us to understand the symbols and meanings that lie behind some of them. which is changeless for all. In May, 1923, the Roerichs were at last on their way to India, where, in that ageless land, amid the snows of the Himalayan range, they sought to turn their thoughts to the Eternal. The Roerichs landed in Bombay in December, 1923, and began a tour of cultural centers and historic sites, meeting Indian scientists, scholars, artists, and writers along the way. By the end of December they were already in Sikkim on the southern slopes of the Himalayas, and it is clear by the speed with which they reached the mountains that the Himalayas were where their interest lay. They initiated a journey of exploration that would take them into Chinese Turkestan, Altai, Mongolia and Tibet. It was an expedition into untracked regions where they planned to study the religions, languages, customs, and culture of the inhabitants. Roerich wrote about this first Central Asiatic Expedition in his book Heart of Asia, and he creates for the reader a vivid account of the wonder of the land and its people. However, the images are nowhere as vivid as in the five hundred or so paintings that resulted from the trek. In Kanchenjunga, Sikkim Pass, His Country, The Great Spirit of the Himalayas, and the Banners of the East series, we can see philosophical concepts and ideas giving birth to visual images, and the splendor of Northern India providing the physical setting. The trek was at times arduous. Roerich tells us that thirty-five mountain passes from fourteen to twenty-one thousand feet in elevation were crossed. But these were the challenges he felt born for, believing that the rigor of the mountains helped a man to find courage and develop strength of spirit. And in spite of obstacles, wherever they went the Roerichs’ belief in the essential goodness of life and the spirituality of man was reinforced. Roerich’s Banners of the East series of nineteen paintings depicting the world’s religious teachers, Mohammed, Jesus, Moses, Confucius, and Buddha, and the Indian and Christian saints and sages, was a testimonial to the unity of religious striving and the common roots of man’s faith. At the end of their major expedition, in 1928, the family settled in the Kullu Valley at an elevation of 6,500 feet in the Himalayan foothills, with a magnificent view of the valley and the surrounding mountains. Here they established their home and the headquarters of the Urusvati Himalayan Research Institute, which was organized to study the results of their expedition, and of those explorations that were yet to come. The Institute’s activities included botanical and ethnological-linguistic studies, and the exploration of archeological sites. Under the direction of their father the two Roerich sons, George and Svetoslav, established a collection of medicinal herbs, and made extensive studies in botany and ancient medical lore, as well as in Tibetan and Chinese pharmacopoeia. In the following year, on a trip back to New York for the opening of the Roerich Museum’s new premises, Roerich raised an issue that had been close to his heart for many years. Using the Red Cross as an example, he proposed a treaty for the protection of cultural treasures during times of both war and peace—a proposal he had unsuccessfully tried to promote in 1914. In consultation with lawyers versed in international law, he drafted a Pact, and suggested that a flag would be flown over all places under its protection. This flag he called the Banner of Peace. The design of the Banner shows three spheres surrounded by a circle, in magenta color on a white background. Of the many national and individual interpretations of this symbol, the most usual are perhaps those of Religion, Art and Science as aspects of Culture, which is the surrounding circle; or of past, present, and future achievements of humanity guarded within the circle of Eternity. The symbol can be seen in the seal of Tamerlane, in Tibetan, Caucasian, and Scandinavian jewelry, and on Byzantine and Roman artifacts. The image of the Strasbourg Madonna is adorned with it. It can be seen in many of Roerich’s paintings, most notably Madonna Oriflamma, in which Woman is depicted as the carrier and defender of the Banner. In this sign and the motto, Pax Cultura, that accompanies it, is symbolized Roerich’s vision for humanity. As he wrote: “Let us be united—you will ask in what way? You will agree with me: in the easiest way, to create a common and sincere language. Perhaps in Beauty and Knowledge.” Roerich’s efforts to promulgate such a treaty resulted, finally, on April 15, 1935, in the signing by the nations of the Americas—members of the Pan American Union—of The Roerich Pact, in the White House in Washington. This is a treaty still in force. Many individuals, groups, and associations around the world continue to promote awareness of the Pact, the Banner, and their underlying principles. The pursuit of refinement and beauty was sacred for Roerich. He believed that although earthly temples and artifacts may perish, the thought that brings them into existence does not die but is part of an eternal stream of consciousness—man’s aspirations nourished by his directed will and by the energy of thought. Finally, he believed that peace on Earth was a prerequisite to planetary survival and the continuing process of spiritual evolution, and he exhorted his fellow man to help achieve that peace by uniting in the common language of Beauty and Knowledge. Nicholas Roerich died in Kullu on December 13, 1947. His body was cremated and its ashes buried on a slope facing the mountains he loved and portrayed in many of his nearly seven thousand works.